Please choose the options: Fridge magnet type, size, quantity, extras to get an instant price. If you can't find what you are after you can click here to contact us or click here submit a quote request. This magnet is produced with commercial grade 0.4mm magnet material to ensure the longevity of the product and has a finished thickness of 0.6mm. 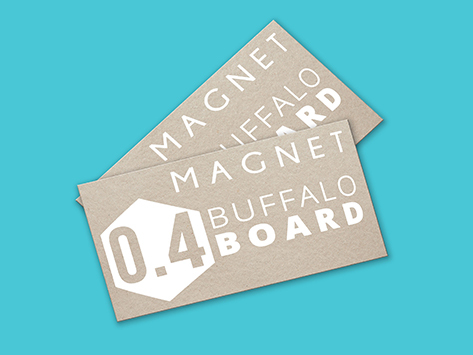 We are the first in the industry to offer you a Buffalo Board Magnet, the perfect alternative for clients wanting some different with a more natural feel. These magnets come with square or 3mm rounded corners, free of charge. Nowadays, it's not only food related business that uses fridge magnets. now you can use it for promoting all kind of business for example hardware stores, plumbing services, even pharmacies. Fridge magnet is one of ideal marketing tools because it can be found nearly every household, it doesn't disturb your customer but it's there for them to use when they want to.